Book the best Windermere cottages, in Bowness-on-Windermere and Windermere Village, on the lake shore or within a 20 minute drive of Windermere lake. 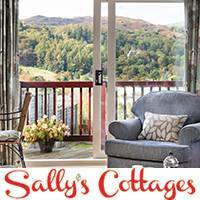 Including Grasmere, Coniston, Grange-over-Sands and Ambleside holiday cottages. Book your Windermere cottages early to get the best deals. Or check for last minute availability. See these Holiday Cottage agencies specialising in the following areas or scroll down for our pick of the best individual cottages around Windermere lake. We don’t think you’ll be able to resist these gorgeous holiday cottages in Windermere and the South Lakes. Each one has something unique, we think you’ll agree with us…. 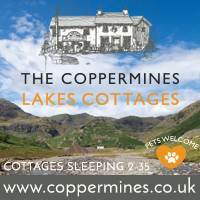 a tranquil Coniston cottage hideaway for 2 …. the best of both worlds for 4 …. When you just can’t decide. Hotel or self catering? Privacy or pampering? Woodlands Hotel near Grange-over-Sands has spacious self catering lodges in its grounds, with all the convenience of a full kitchen and sitting room but just a hop away from the hotel bar and restaurant. Some lodges have private saunas too for that extra pampering – or easing the old muscles after the fells! 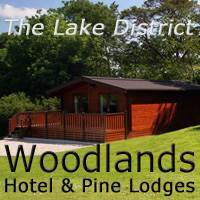 And all just a 15 minute drive from the foot of Windermere lake and Lakeside Pier. slap bang in the heart of Windermere for 4 …. Sometimes you just want to be close to where it’s all happening. And there aren’t many Windermere cottages better situated than Cosy Nook, just off the village centre, but in a quiet courtyard. Pubs, shops and restaurants are just a convenient 3 minutes away. This lovely little pet friendly holiday cottage in Windermere village has been beautifully styled with contemporary furnishings. Just perfect for friends, family or a romantic break for just 2.
thinking Ambleside cottages for 5? …. We love this little Ambleside cottage for 5, just a stone’s throw from the centre of the village, with private parking. So do visitors. If this is one you’re considering, don’t dither, Barney’s Cottage books up early every year. Lovingly restored, this traditional pet friendly Ambleside holiday cottage retains many original character features, has a little garden and is located in the most popular area to stay in the village. messing around in boats, a lakeside Windermere cottage for 4 to 6 …. There aren’t many Windermere cottages with direct access to the lake, let alone boat launching and beach storage facilities. Beech Tree Cottage is one of four holiday cottages in the converted stables of Stott Park Mansion, just a 5 minute wander through lovely woods to the lake shore. Lakeside Pier with its popular attractions and access to the Windermere Lake Cruises route is just a 20 minute walk. gorgeous Grasmere gathering for up to 10 …. A gracious Victorian house set around with meadows and within walking distance of Grasmere shops, restaurants and pubs. Recently refurbished, Little Parrock comfortably sleeps 10 and is perfect for big family and friends get-togethers and holidays. There are amazing views all round, superb walking from the door and a gorgeous large garden for family bbq’s and games. That families love this Grasmere holiday cottage is obvious from the top notch reviews. Windermere self catering in the grandest style …. Somewhat of an understatement to squeeze this incredible self catering property into our Windermere Cottages section – you could probably fit a dozen holiday cottages in here! The Oaks is a gloriously refurbished mansion, set just a mile from popular Bowness and sleeping 25 in 12 bedrooms. But that’s just the start. The 5 star accommodation mixes original features, such as mullioned windows, with contemporary luxury. 11 bathrooms, 2 outside hot tubs, a sauna, large mature gardens – you just have to read on…..